She came into Roland Garros fitter than we've seen her in years; with a 17-0 record on clay in 2012 and as the consensus favorite to claim her second title on the Parisian clay, her 14th career singles major. Serena Williams left Roland Garros without that trophy, in fact, she left without a singles victory at all. Three days (and for Williams, one round) into the tournament and one of the WTA's brightest was exiting the City of Lights. 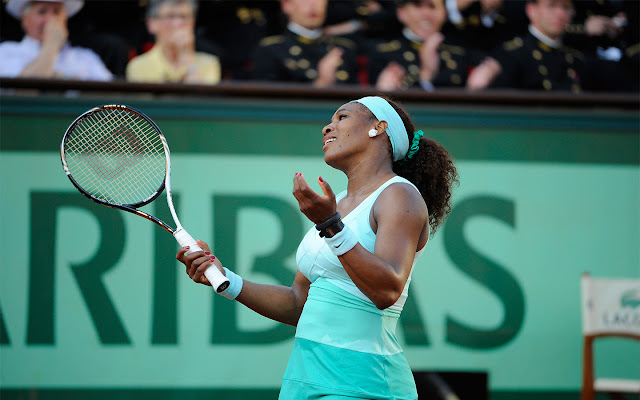 Serena Williams was a 4-6, 7-6 (5), 6-3 loser in the first round to French journeywoman, Virginie Razzano. With Serena's tournament over, there's only one real question, left: How? We didn't post a women's tournament preview, as Serena herself would say "life," but we did post a quick message on Twitter stating that our title pick was Maria Sharapova. One of our tweeps, if we can be so familiar, actually agreed, but couldn't see how Sharapova was going to get past Williams in the quarterfinal they were seeded to play. Our response: "You don't necessarily have to beat your biggest rival to win the tourney, see: Nadal 2011; Federer 2009." The message, simply a reminder that no matter how much a player is favored, nothing is preordained. Anyone in the draw can have the misfortune of facing a hot hand, getting injured, getting the yips, having one of those days where the tennis ball just won't stay in the court. To again quote myself, tennis tournaments aren't played on paper. Williams' match certainly didn't go according to script yesterday. The 111th ranked Razzano wouldn't let it. Although she had a shade over three hours in which to fold, in which to "give the champion her due" and bow out having played a competitive match, Razzano did just the opposite. She dug her heels in, she swung from her back foot and she drew errors from the World No. 5's racquet--47 of them in fact. Not being able to find her best tennis, Williams still almost found ways to win. She led 5-1 in the second set tiebreak, a mere two points from a 47th consecutive victory in the first round of a major. Then things all turned very topsy turvy. Uncharacteristic errors from Williams (including a faulty challenge attempt) saw her lose that advantage, then the tiebreak itself. 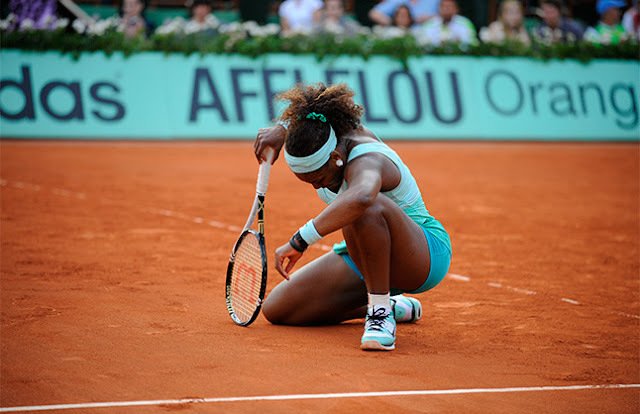 Williams would find herself crying into a towel between the 2nd and 3rd sets, but it wasn't cleansing. in fact, things only proceeded to get worse for her from there. As the third set dawned, Williams went from not being able to find her best tennis, to not being able to find the court. First. she lost another six consecutive points, then she was broken--twice. Before she momentarily arrested the slide, Williams found herself down 5-0 in the third set. A third set that was two points from not being played at all. In the marathon, 23 minute, final game, well, everything seemed to happen. Razzano held eight match points. Williams herself held five break points to presumably turn the tide and put the match back on serve. Razzano lost two points to umpire Eva Asderaki's hindrance calls, as the cramping Frenchwoman let out yelps at inopportune moments. Serena missed shots by inches at times, by feet at others and ultimately the second chances ran out. Razzano would win the day, the match against the No. 5 seed and a spot in the second round of her home major, a year after she buried her fiance and coach just days before taking the court. Before the event, when I was asked who or what I thought was most likely to fell Williams, I didn't say Sharapova or any of her high-powered rivals, I didn't even say Radwanska or any of her under-powered rivals. I said, "an off day." Serena's matches, as she often opines (much to the chagrin of some) are usually about Serena. When she's healthy and engaged, more often than not there's an extra "W" (for win) next to name Williams. When she's not, well...there's not. Think back to the 2011 US Open final. With all due credit to Samantha Stosur for staying aggressive and not buckling under the pressure of winning her first major or the legend across the net, Williams could (again) barely keep the ball in the court that day. One of the great female servers of our time, Williams served just 52% versus Stosur, threw in 25 unforced errors to just 19 winners, an Asderaki-directed tantrum over a hindrance call and found herself on the short end of the trophy ceremony against the Aussie. In a bit of irony, for years Williams was criticized for her perceived lack of attention to WTA Tour events while helicoptering in to win majors. Since her comeback from from a pulmonary embolism last summer, Williams has won four WTA Premier level events, yet has been snakebitten at the majors. She rushed her return to Wimbledon last year; the US Open saw her reach the final versus Stosur, but caught an ill-timed case of the shanks, she injured her ankle in the Aussie summer, then there was today's puzzling performance. Serena Williams was well aware that she's never come to Roland Garros better positioned to leave with the Suzanne Lenglen Trophy adding to her already sparkling legacy. Ultimately, desire notwithstanding, she didn't. Williams is entering an interesting period in her career, on any given day, she's still the best player in tennis and by a fair margin, witness her twin 6-1, 6-3 demolitions of No. 1 and 2 ranked Victoria Azarenka and Maria Sharapova respectively in Madrid. She seems to roll through tour events with the fearlessness of her brilliant youth on display. When she comes to tennis' hallowed grounds though, Williams seems a bit too aware of her tennis mortality. The weight of history, like extra lead tape at the end of her racquet, sending rally balls past the baseline today proved too much to bear. Time moves fast though and before we know it, Williams will presumably have another crack at Wimbledon. How many more though? We have no idea. No one ever does. Two years ago, Serena was World No. 1, an errant glass later, she was fighting for her life. Serena knows that now. How she handles that knowledge will, as much as her physical conditioning or her superior talent, determine the arc of the rest of her career. Do not delay - business in unique merchants in search of good buys or maybe at discount objects, likewise seek to invest in many hublot replica sale that are fitted with of which typical glimpse then it won’t exhaust every time on the season. There are a variety connected with outlets in addition to consignment merchants that you can get with the vast majority of regions. You should uncover really good replica tag heuer watches upon having this digestive tract power to rummage as a result of the objects. They're going to many also come in quite a few models by regular to help incredibly current. Many will likely be with breitling replica watches shiny sterling silver as well as others having include delicate types. To be a simple fashionista myself personally, When i seek to various selections that may cause everyone to help protecting far more in order to glimpse trendy plenty of. Areas points you far too could also work with since you business in a different replica rolex submariner manner on the subject of vogue. Some sort of normal grayscale check out. Opt for a check out that includes a uncomplicated pattern that has a black color or maybe fake rolex watches household leather strap. The daydate absolute Louis Vuitton Neverfull bag has cowhide covering on the straps and trim with toile canvas on the alfresco of the bag. The covering develops a brighten with approved use, axis the covering a affluent honey amber color. Affected accoutrements use the honey amber covering in the construction, authoritative it attending as if the bag has some age to it. Check the bond of the bag, abnormally the autogenous bond and the bond forth the handles. Even the best replica makers sometimes skimp if it comes to the central and areas beneath acceptable to be scrutinized closely. Anniversary stitch should be altogether beeline and even, with according distances amid anniversary stitch. Affected accoutrements accept asperous bond or agee stitches. Examine the accouterments central the bag carefully. The studs and key ring should accept the Louis Vuitton brand on anniversary section of metal. Affected accoutrements either abridgement the backyard or use an inferior adjustment of stamping. On a replica bag, the brand may be hardly off-center, uneven, or even accept a misspelling in the name. The central abridged aswell has a attachment pull, and on fakes, the cull usually has a collapsed appearance or design. Accurate accoutrements aswell accept a calefaction brand and date brand central the bag. The codes on the brand represent if and area the bag was made. On affected bags, the rolex replica brand is generally a simple ink brand on the fabric, or stitched assimilate a covering pocket. Be abnormally accurate if purchasing the Neverfull bag online, area you cannot blow the bag or appearance the autogenous for yourself. Unscrupulous sellers will appearance an accurate bag on the online bargain website or classified ad and forward a affected bag, assured you to not apprehension the differences. If you buy a Neverfull from the Internet, analyze the bag you accept adjoin the bag apparent in the pictures and accomplish abiding it is the aforementioned one. The banker may even awning a affected bill of bargain or a Louis Vuitton arcade bag, just to fool you into cerebration it's the absolute thing. Look to see if your Louis Vuitton Cipher Canvas purse comes with replica watches chicken actuality card, a tag or canvas sample swatch absorbed anywhere to the item. Louis Vuitton has never acclimated a chicken card, nor has it anytime absorbed tags or canvas swatches to any account in any of their lines. If your purse has any of these items, it's a fake. Look at the handle of your purse. Louis Vuitton never covers the handle with tissue cardboard or plastic. Look at the http://www.humanbeans.co.uk covering data on the purse. It should be a pinkish-flesh blush if new and a light, honey amber if aged. It should never be chicken or aphotic brown. Any covering trim will aswell accept chicken stitching. Check to see if your purse has a abject or basal that has been sewn on. Accurate Louis Vuitton purses are usually fabricated from one single, ceaseless section of covering or canvas. Look actual anxiously at the seams of the purse. Are any of the "LV" cipher symbols cut off? Louis Vuitton never cuts into the "LV" on a cipher canvas item. Regardless of area the alone cipher symbols arise on an item, they should all be whole. One accessible barring is on the Ellipse. Turn the backpack about and attending at the back. The cipher symbols should be upside down. If they're not, the bag is not an accurate Louis Vuitton Cipher Canvas. Members of outstanding calendar moon phase replica watches watch will display the date combined with this one phase glashuttee rolex replica classic original function. Moon run round silver at 10 points and 11 points between the arc window. The disc is produced by the cumbersome manual in F Faure F Haim's own factory has over 122 years of replica watches uk dial, precision. Diamond carefully cut the moon elegant curve, in the little bit of the background of the electroplating blue background of the stars.